‘Slamchosis’ features ten tracks of bludgeoning brutality that take everything to the next level of sickness. Featuring vocals that dredge the sewers of disease with their utter inhumanity, riffs that will crack foundations and disturb the long dead, this album sees Kraanium hitting new peaks of precision delivery at the same time as they unearth new depths of horror. Over the last two decades they have shocked, outraged and entertained as they cracked skulls and shattered spines in the pit. 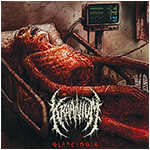 ‘Slamchosis’ goes one step further than Kraanium have ever gone before; one step further beyond the boundaries of good taste, one step further on the Richter scale with their earthshaking heaviness. ORDER NOW! There is a soundtrack to the thoughts of men that exist solely to destroy. It is the distillation into sound of the total absence of light, hope and life and gives voice to the essence of bleak, nihilistic hatred. 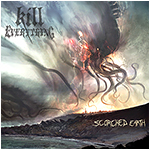 It will disgust you with its unmitigated brutality, it will unnerve you with its utter lack of human emotion and it will offer you nothing but death… that bludgeoning, battering soundtrack comes in the form of the debut album by Kill Everything, entitled ‘Scorched Earth’. Featuring two founding members of Devourment, this is the aural equivalent of being buried alive in a plague pit – suffocating, claustrophobic, rancid with the stench of death, enveloping horror at every turn. There have been whispers in the depths of the underground about this release for some time now, the devoted followers of the heaviest, darkest death metal waiting impatiently to test themselves against its harsh horrors, eager to experience a new level of barbaric butchery. Well now it’s here and as the saying goes, be careful what you wish for… ORDER NOW! There are many ways to kill… some are simple, frenzied and bludgeoning. Others are more complex and more creative… more artistic. The edifice of horror that Abhorrent Deformity have created with their second album, the towering testament to death that is ‘Slaughter Monolith’. It’s compelling, enthralling, fascinating – at times breathtaking, both in its brutality and its magnificence. The captivating dark beauty, the grandeur and the intricacy are drawn together in Slaughter Monolith’s cover art, putting the final perfect seal on Abhorrent Deformity’s gloriously grotesque, godless creation. ORDER NOW! Extremity has a new face, a new name, a new definition. Pushing against the boundaries of endurance, clawing at the walls of pain… part man, part machine and all monster. 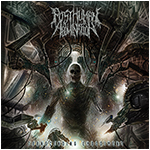 From beyond the wastelands that lie at the edge of sanity… Comatose Music welcomes Posthuman Abomination! Bringing together current and ex- members of Devangelic, Natrium, Pit of Toxic Slime and Vomit the Soul (to name a few), Posthuman Abomination is an elite unit of twisted, bludgeoning, blasting, technical death metal destruction poised to unleash their debut full length ‘Transcending Embodiment’. Like a swarm of soulless medical droids gone mad, unemotionally dismantling the human form, rebuilding their creators into hideous parodies of human life… creating a posthuman abomination! ORDER NOW! 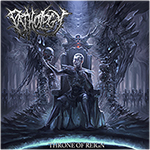 The Russian death metal force Aborted Fetus strike back with another pulverizing onslaught of Ural Massive Brutality on their 2018 full length release ‘The Ancient Spirits of Decay’. Once again this revolting ensemble delivers unstoppable aural punishment as you’ve come to know and expect. Nothing less than complete obliteration awaits with this guttural slam assault! Amazing cover by Armaada Art. Mixed and mastered by Alexander at TsunTsun Productions. ORDER NOW!